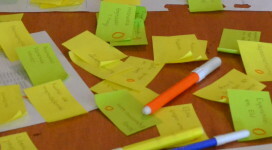 Commissions and interest groups are open groups which help the co-operation of activists with similar interests so that they can work in the same field or project. All members are entitled to join and participate in them. These are working groups who have a fundamental role in the structure of the organisation. They are External Relations, Active Training, National Activism, Marketing, Congresses, Technology, Talent. This commission brings together people who want to train other members of TEJO in a diverse range of topics or who want to learn how to train others. 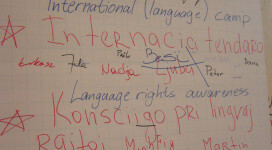 The commission communally thinks of topics and plans for future training sessions during different Esperanto events. 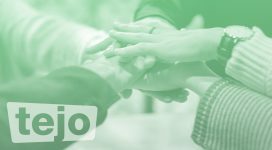 Do you have skills that you want to share with other Esperantists? Do you want to learn how to successfully share your skills with others or do you want to help others become good trainers? If so, you are welcome in this commission. (+info). TEJO is a member of the European Youth Forum and the International Coordination Meeting of Youth Organisations, where we work with other European and global youth organisations who aim to influence public opinion. This commission looks after the external relations of TEJO. (+info). Here are the people who work on the organisation of the International Youth Congress, TEJO programs during international events and those who want to swap experiences. TEJO organises commissions to bring together activists who live in the same regions/parts of the world. The goal is for them to exchange experiences, ideas and information about their activism, help promote the movement in neighbouring countries where there are currently no activists, create marketing materials in national languages, work together to organise youth events, training seminaries, co-operate participate in projects etc. Would you like to take part in the commission for national activism in your region? Do you know other activists in your country or region who would be willing to work together? Contact us. (+info). The marketing commission looks after many projects, both internally and externally, to promote the image of TEJO, providing information, translation of the website, as well as engaging and informing the membership. (+info). 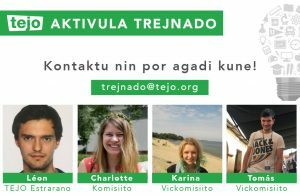 We work to ensure that all young people, who want to work for Esperanto, find a suitable possibility to do so in TEJO. To do this, it’s important to promote the transparency of TEJO, so that new people and the online world can find for themselves suitable activities. It is also necessary to be certain that the work is done to a high quality, under good conditions and efficiently. To do this, we strive to give activists the skills in people management, teamwork and to help efficiently transfer knowledge and to spark enagaement, we write guidlines, helpers por different tasks and roles. Are you a new people and haven’t found enough information? Are you an activist who has something to say? Write to us. (+info). A new reference point for topics relating to technology. Currently, it is only for internal and projected plans.